Go for a jaunt from Maleny to Tanawha to see Maroochy Regional Bushland Botanic Garden about 42 minutes away. Spend the 29th (Mon) exploring nature at Kondalilla National Park. Next up on the itinerary: take in nature's colorful creations at Maleny Botanic Gardens & Bird World, learn about wildlife with up-close encounters at Australia Zoo, get great views at Gerrards Lookout, and hike along Mary Cairncross Scenic Reserve. To find out how to plan a trip to Maleny, use our trip itinerary maker. Brisbane to Maleny is an approximately 1.5-hour car ride. You can also take a train; or take a bus. In April, daily temperatures in Maleny can reach 30°C, while at night they dip to 19°C. Finish up your sightseeing early on the 29th (Mon) so you can travel to Ingham. Ingham is a town and locality in the Shire of Hinchinbrook, North Queensland, Australia. Kick off your visit on the 30th (Tue): don't miss a visit to Mercer Lane Mosaic, identify plant and animal life at TYTO Wetlands, and then admire the sheer force of Wallaman Falls. Keep things going the next day: explore the wealth of natural beauty at Broadwater National Park. For ratings, photos, more things to do, and tourist information, read Ingham trip itinerary planning tool . Getting from Maleny to Ingham by car takes about 15.5 hours. Other options: fly. In April, Ingham is a bit warmer than Maleny - with highs of 35°C and lows of 24°C. Wrap up your sightseeing on the 1st (Wed) to allow time to travel to Noosa. Explore the numerous day-trip ideas around Noosa: Caloundra (MaisyMoo & Kings Beach) and Mooloolaba (HMAS Brisbane, Mooloolaba Beach, & more). 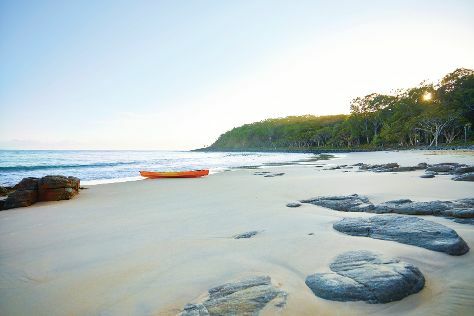 Spend the 2nd (Thu) exploring nature at Noosa National Park. And it doesn't end there: kick back and relax at Noosa Main Beach, take in panoramic vistas at Mount Tinbeerwah, wander the streets of Hastings Street, and browse the eclectic array of goods at The Original Eumundi Markets. For reviews, traveler tips, photos, and other tourist information, you can read our Noosa trip itinerary tool . You can drive from Ingham to Noosa in 15 hours. Alternatively, you can fly. Finish up your sightseeing early on the 5th (Sun) so you can go by car back home.